Motor driven automatic lubricator refillable with standard grease gun. Delivers grease at up to 900 psi. The Ultimate Luber delivers grease through long feed lines and to cycle progressive distributors to feed several bearings consecutively. 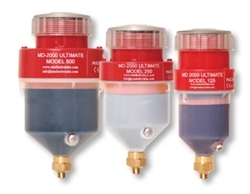 ATS Electro-Luber Original Automatic Lubricator, 125 cc Capacity "Mini Luber"